Homocysteine is an amino acid produced in the body during the breakdown of another amino acid called methionine, which is found in red meat. Typically, it would not cause an issue for the body, since it would simply be metabolized back into methiondine and broken down even further by the body from there but there are circumstances which disallow the body from performing this task and allow this amino acid to build up. The end result being severe cell damage and illness. 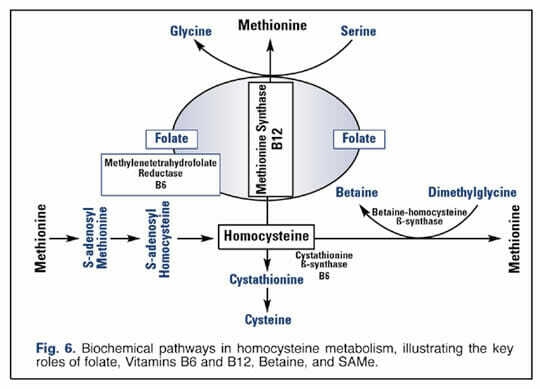 Homocysteine travels through the body via blood plasma. Increased levels of homocysteine have been linked to several heart and arterial complications such as an increased risk of coronary heart disease, stroke and peripheral vascular disease. In fact, it is believed that the risk that homocysteine has on causing these health problems could possibly surpass other, more commonly recognized, risk factors such as cholesterol, fibrinogen, C-Reactive Protein (CRP), smoking, age and gender! In addition, homocysteine elevation seems to have an effect on memory and is therefore deemed a suspect in disorders such as dementia and alzheimer’s. The primary cause of homocysteine elevation is inadequate B6, B12 and Folate in your diet. These nutrients are necessary because they act as the catalysts for the metabolism of homocysteine. As you can see from the image above, the conversion of homocysteine to cysteine-known as transsulfuration-requires an enzyme called cystathionine b-synthase (CBS) along with vitamin B6 as a cofactor. In the absence of vitamin B6, transsulfuration cannot proceed, and homocysteine begins to build up and damage blood vessels. On the other side of this model, we see the conversion of homocysteine back to methionine, which is called remethylation. Folic acid and vitamins B6 and B12 are required for this reaction. Betaine can also facilitate remethylation. When levels of these nutrients are low, remethylation cannot proceed efficiently, allowing homocysteine to accumulate. The second cause is Niacin Build Up. Though a B vitimin itself (Vitamin B3), and good for you in it’s own right since it is shown to increase good cholesterol and lower bad cholesterol, doses in excess of 1000 mg have been shown to increase homocysteine. Third, we have the medication Metformin, which is one of the top prescribed medications in the US for everything from Type 2 diabetes to heart failure and polycystic ovary syndrome. It is believed that Metformin’s effect on homocysteine levels have to do with it causing decreased absorption of Vitamin B12- which we showed in our chart above is necessary for remethylation of homocysteine. The fourth (and this will probably shock a lot of people) is Coffee. Believe it or not, coffee, and the amount if it that you drink per day can have a direct effect on your homocysteine levels. it is not directly known what it is about coffee that causes this effect. Getting, or Keeping, your homocysteine levels in check generally just requires some simple lifestyle changes. For starters, exercise, avoid alcohol, and eat a diet high in protein. Also, remember your vitamins. Taking a high-quality supplement like TriVita’s Sublingual B-12, B-6 & Folic Acid Complex is a great start. ← Nopalea Juice Review: Is It Another Health Juice Scam?